Low Income Home Energy Assistance Program (LIHEAP) Outreach will be available later this winter at the Heyworth Library on Friday, December 11. LIHEAP representatives will assist anyone that would like to apply for this assistance from 10:30 a.m. through 3 p.m. Any questions regarding this program can be asked through Mid Central Community Action at 309-829-0691. Don’t forget to RSVP for the Third Randolph Township History Symposium, “History in Your Own Backyard”, set for October 20 from 6 p.m. – 8 p.m. at the Heyworth Public Library. Please bring along anything that you may have related to the history of our area. We are especially looking for information on older homes and businesses that were in our area, and those still here. Other items might include pictures, artifacts, and objects, maps, documents, stories, advertisement items, or family materials. We are hoping to continue each fall to learn and gather information from each other. Refreshments provided, please RSVP by October 19. Offers over 80 magazines for 7 day checkout. If we don’t have the title you want, we can interlibrary loan what you are seeking. October 15, Family Story Time, 6:15 p.m.
45 minute program on Thursday evenings through October 22. This evening is geared for pre-school through first grade, however the whole family is welcome to join in on the fun. Come explore, participate in art, and enjoy stories. October 16, After School Movies, 3:20 p.m.
Every Friday the library is open. Bring a friend and your own snack! All drinks need to have a screw on cap – no juice pouches or cans please. October 19, Heyworth Knitters and crafters, 1st and 3rd Mondays of each month, 6:30 p.m. -7:30 p.m.
We are thrilled to offer knitters and crafters a space to create and socialize! This group is very willing to teach anyone who would like to learn to knit. We have yarn, instructions for beginning project, and needles to get you started on a new hobby. If you want to learn how to knit you must sign up to attend, so our group can have all you need ready for the evening. If you are a knitter or a crafter looking to socialize with others in our area, just show up as your schedule allows. Available to anyone 4th grade and up. October 20, 3rd Randolph Township History Symposium, “History in Your Own Backyard”, 6 p.m. – 8 p.m.
October 26, Monday Evening Book Club, 6:30 p.m.
We are always seeking new people to join us! Give us a try, we have a friendly talkative bunch. It’s a great way to meet new people in town. Books in regular and large print available, as well as audiobook, at the library for checkout, stop in and get yours today. October 27, Lego Block Party, 4th Tuesday of each month at 3:30 pm. November and December will meet the 3rd Tuesday due to holidays. October 28, Heyworth History Club, 4th Wednesday mornings at 10:30 a.m.
October 29, Halloween Trick or Treat at the Library, 5 p.m. – 7:45 p.m.
All kids receive a free book. 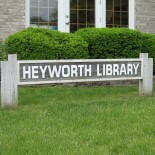 This entry was posted on October 14, 2015 by Heyworth Public Library District.